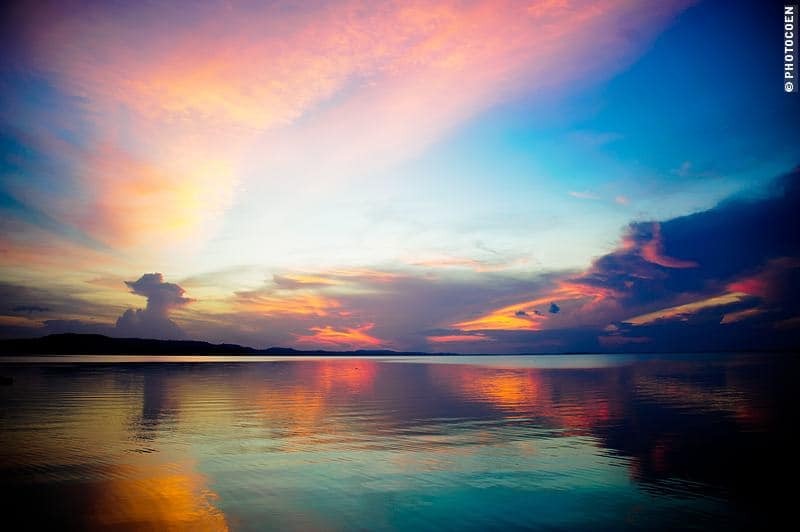 The water is smooth as glass, there is no wind when suddenly we see circles appearing on the surface. Something is emerging from the depths and disappears again. Grey shapes move around in the grey water. Caymans are the first we can identify. Then, to the left, elegant curves emerge and disappear: giant otters. Right ahead there is more movement. Tails of dolphins, while the squarish heads coming up for air must be manatees. We’re stunned. The day already started so beautifully with kingfishers, weaver birds and bem ti vis (“good-to-see-you” bird; love that name) waking us. It was still cool outside: a bit cloudy and the sun was still hiding behind the hill. As we ate breakfast, cicadas were singing monotonously as background music on the forested hill. When the sun rose above the hill, its beams reached the far distance of the lake, lighting up what once was a forest but now are dead, white poles in the water due to the construction of this reservoir. We take out the binoculars and enjoy the spectacle. On and on it goes. Above the water, below the water, a snout that emerges to get air, then submerges again. The distinct sound of water sprouting like botos-do-cor-rosa (type of freshwater dolphin) do. Curves, bends, bows, round and round, on and on. They must be having a grand breakfast down there. Suddenly they’re gone and the water is smooth like a mirror again. Breakfast for aquatic animals is over. We drive to the nearby water Mammal Research Center. “It’s closed,” the guard informs us. I hold my breath for a while, then very slowly lean outside my window and, in the kindest words I can find, explain to the guard that we want to visit this center and that in order to prepare for this visit I went to the tourist office in Presidente Figueiredo to get a confirmation that it would be open. That visiting this center means driving 160 kms. And that it’s impossible that after all this trouble, we should not be allowed to enter. The guard starts an elaborate story about Rules and Regulations, about Who and What according to procedures and what have you. Bottom line: he can’t open the gate. In Brazil, the question “entendeo?” can only be answered with one word: “Yes” (like in English”How are you” basically has to be followed by “fine” without giving the question any further thought). “How are you” basically has to be followed by “fine” without giving the question any further thought). In Brazil you never answer “Entendeo” with “No”, let alone, “No, I don’t understand one bit of this bureaucracy.” However, this is what we do, in unison. “Não. Não entendemos nada de isso.”The guard stumbles back and barely manages to stay on his feet. The guard stumbles back and barely manages to stay on his feet.”Not only do we not understand. We’re furious,” we add. Again, in unison. This stuns the guard to the extent that he starts calling someone. But he only has a radio and can’t reach the right people. The gate stays closed.”We’ll be back,” we state, and drive to the nearby town of Balbina, determined to get a permit. “We’ll be back,” we state, and drive to the nearby town of Balbina, determined to get a permit. Really, at times Coen works miracles. It never ceases to amaze me. 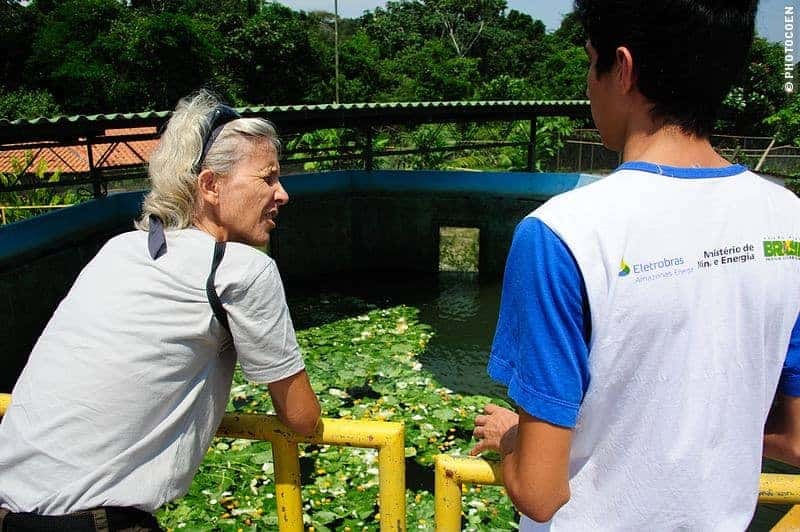 When we arrive at the research center we never see Daniela but meet Fabricio, an intern, but never mind. A nice student with a quiet demeanor who informs us we’ll get a quick tour. However, when we leave more than an hour later, we don’t feel we have been rushed at all. Maybe we haven’t seen half of it, who knows. 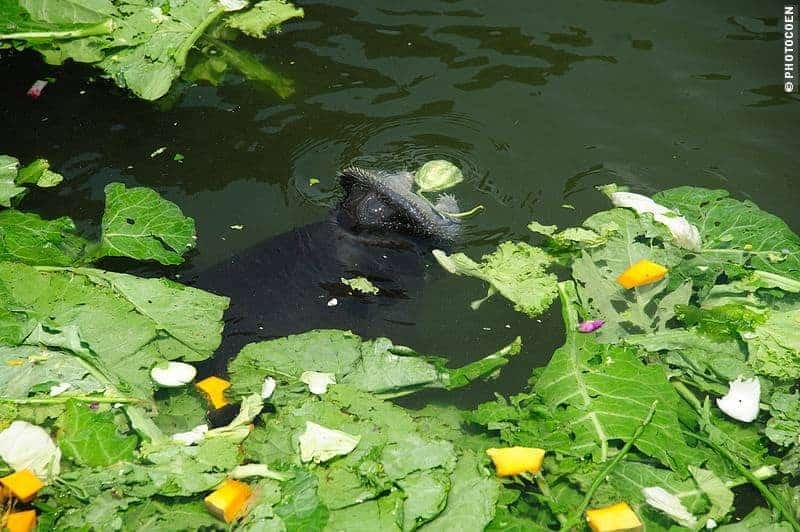 The Aquatic Mammal Preservation and Research Center (CPPMA) has been working on a rescue program for Amazon Manatees (Trichechus inunguis) since 1992. Fabricio tells us that major enterprises like Electrobras have to support or maintain some sort of environmental program (like Petrobras supports Brazil’s sea turtle programs), hence this center. 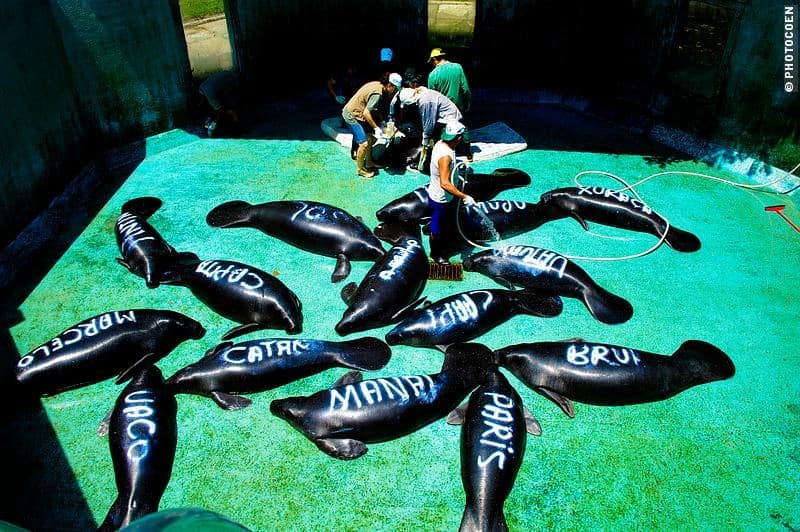 The manatees are the center’s main focus and the tracajá turtles are second. 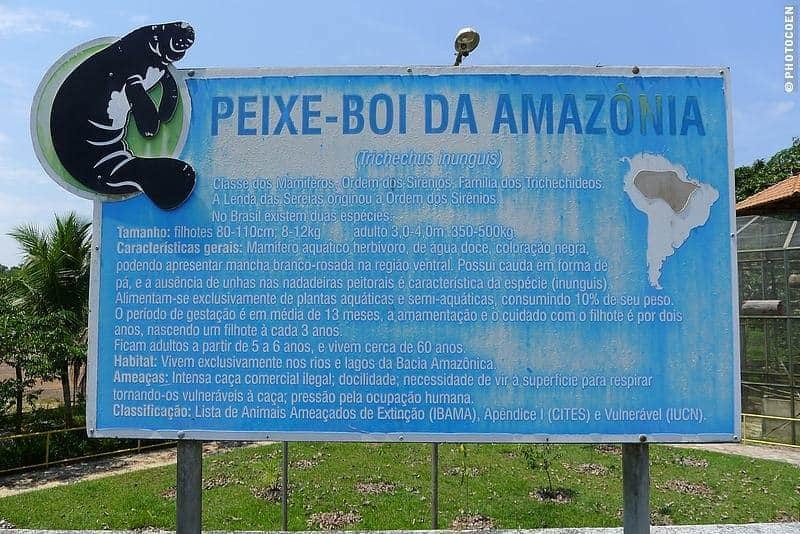 Other than that it cares for botos (freshwater dolphins), giant otters, otters and other freshwater turtles. We walk up to enormous tanks that are temporary or permanent homes for manatees that were brought in wounded or sick. In many cases they can be returned to their natural habitat, sometimes not. There are different tanks for females, males and the young ones (3-4 years). In a small tank, inside the center, we see a baby manatee of 5 months old, without a mother. It is raised by the researchers, who feed it some 3 bottles of milk per day as well as vegetables. So we keep our distance, keep our mouths shut and just watch and enjoy.